Global advanced technology and modern knowledge, with present day documentations, has led multitudes to question the history to our last remaining seventh wonder of the ancient world. There are many whom believe the Great Pyramid was not built by an egotistical Egyptian Pharaoh. Some believe it to be much older, and advanced; as some have implicated the Great Pyramid as a machine. To understand this new-age theory, one must investigate our actual-factual verifiable history of the Pyramid itself. The easiest way to reveal this is in understanding it's architectural nuances, which have been catalogued by historical professionals long before the cleaned up tourist Hollywood attraction of what appears as todays Great Pyramid existed. From the late 1800's, we are given documentations to certain nuances by the grand sir Flinders Petrie. 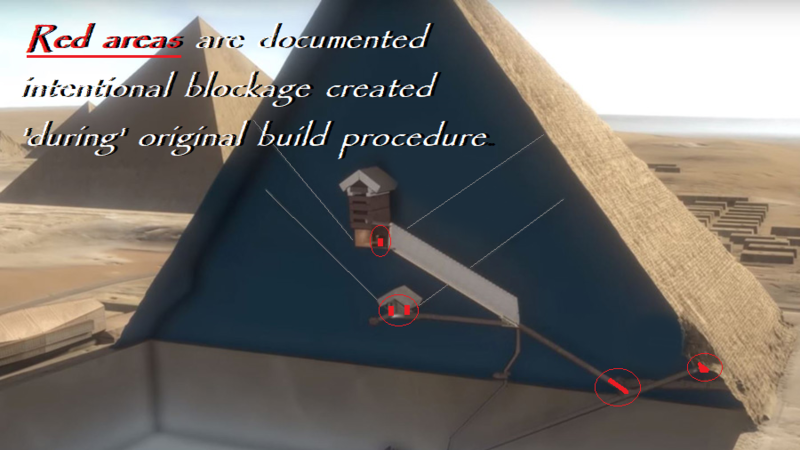 His inspection and documentations revealed the Great Pyramid's Entrance-door is constructed from a single stone block that swings up and 'outwards'. 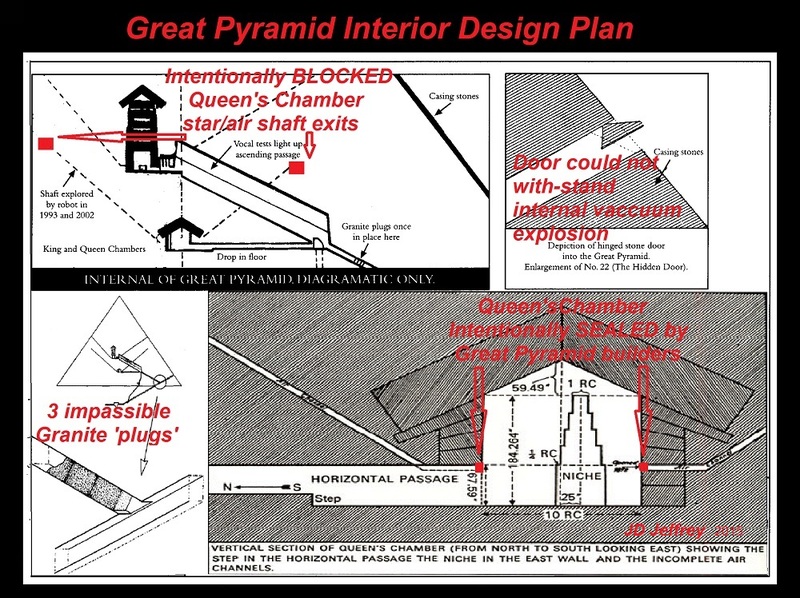 With some speculating the pyramid as a type of hydrogen machine (or any liquid vapor system) the 'supposed' swing-door could not withstand an internal blast, as the vacuum would push the door open releasing whatever proposed chemicals being used as a hypothetical machine. The three Granite 'plug's blocking the access upwards in the Ascending passageway were sealed shut during construction with the first megalithic stone inserted into a gravity-fed 'pinch seal'. These three granite-plug stones made the Ascending passageway impassable, thereby having to be tunneled around to gain entrance to the above chambers. The Queen's Chamber erroneously named 'Star/Air-shafts' were intentionally blocked at both ends, therefore were inoperable and could not be used. They are intentionally blocked at the exit point to the outside of the pyramid and at the entrance inside the Queen's Chamber. They were sealed over and had to have the stone broken through to be revealed in 1872. The wall stones that make up the Queens Chamber are of one piece and too large to move through passageways after construction of the pyramid. This construction nuance details the wall stones were inserted 'during' the build procedure. These shafts could NOT be used for anything negating the sealed over use of the Queen's Chambers Southern shaft as a Dilute Hydrochloric solution and the Northern air-shaft for Hydrated Zinc Chloride solution causeways represented by the proposed Pyramid Machine theory. The Queen's Chambers shafts were hermetically sealed proving claims of an opening and closing valve system useless, thereby dispelling the myth of liquid or nitrogen being mixed and moved from within. At the end of the Queens Chamber shaft, according to video and photographic evidence during Gattenbrinks Robotic inspection, are various Red-ochre painted hieroglyphs. Any type of liquid or steam would have long ago evaporated the simple red paint. 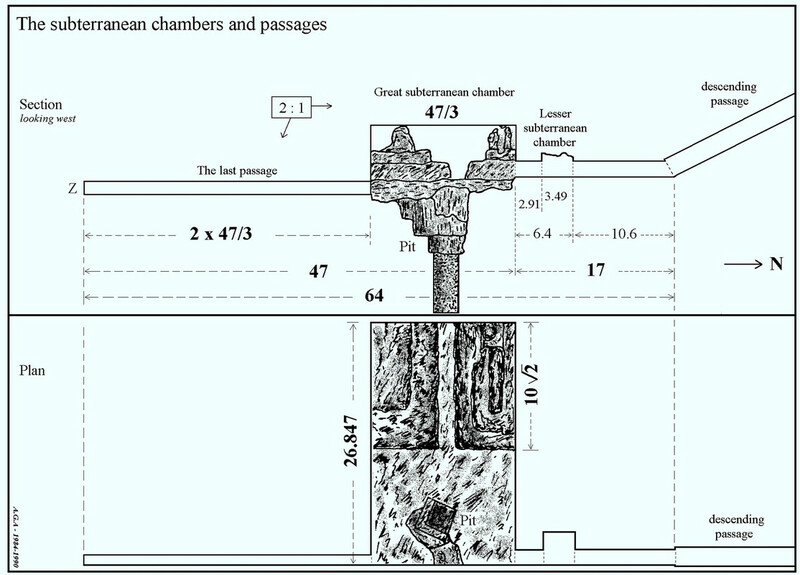 Also it is heavily speculated due to marks in the entrance passage Hall to the Queens Chamber that the Hallway at one time had a stone blocking entrance into the Queens Chamber. It should be noted that no other pyramid has Air/Star shafts making the Great Pyramid exceptional in this fact. Also of the two point five million stones used to create the Great Pyramid, it is mostly limestone with many loose cavities between blocks, making it's water tight theory obsolete. Let it also be noted that the Great Pyramids Descending Passage-way and Subterranean Chamber are created from Limestone bedrock. Continuous flooding of any liquid type (or steam) would erode the simple bedrock as any first-year apprentice Geologist would point out. If geologist Robert Schoch's thesis of the Sphinx water erosion is to be believed, that detail alone reveals what water can do to limestone bedrock. 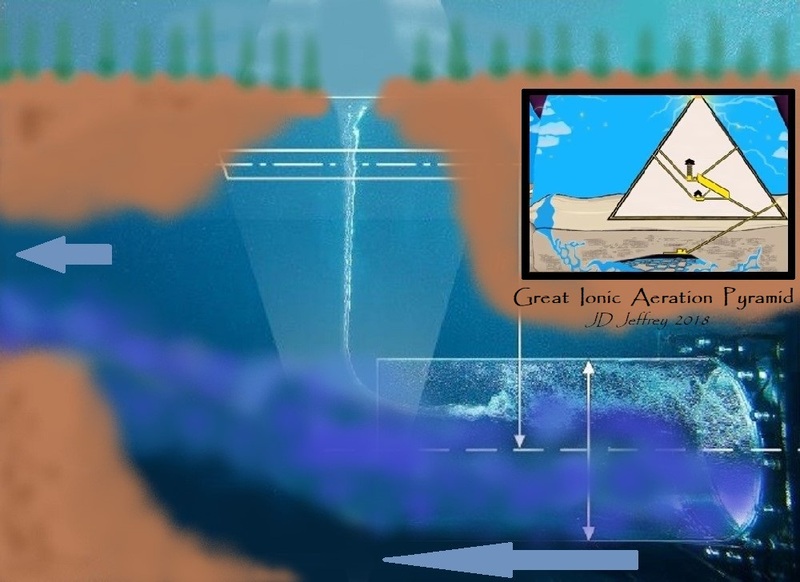 The issue with this certain idea of a water-chemical solution machined vision of the Great Pyramid is we are looking at a cleaned tourist Hollywood version to the Great Pyramid. What negates this theory of a chemically induced machine is the historical truth of the Great Pyramid's internal megalithic stone construction itself. Where the lower angled Descending passageway area reverts to a horizontal passaweway before entering the Subterranean area, there is no 'pool washout' in the bedrock that would have been created from the waterfall effect rushing down the 26.5 degree angle of the Descending passageway. Nor is there evidence of the effect water creates on and through bedrock in the Subterranean's entrance 'step'. The step 'edge' does not reveal wash-away effect from water flowing over into the Subterranean Chamber. In nature, water falling at that degree angle over bedrock would have eroded the step into a V shape; the same natural v-cut shapes we see identified at the Sphinx location. 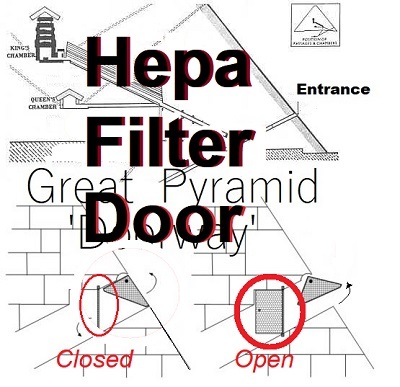 We see no evidence of this in the Great Pyramids lower inside bedrock passageway and Subterranean entrance step. In the early 1300's, the Gizeh location suffered a catastrophic earthquake which dislodged the Great Pyramids polished Tura limestone outer casing stones, allowing them to be stripped and used as quarried stone in quickly fabricating Palaces, Mosques and other buildings. The casing stones were sealed which kept water and other forces of nature from penetrating into the pyramid's interior shafts, passageways and rooms. This unfortunate happenstance has allowed for the past 700 years what little rain-water the Gizeh desert now receives, to seep into the building causing stains from water mixed calcium extrate and other trace minerals; which has been misidentified from new-age pyramid investigators, using this misidentification to conclude the pyramid was once a chemically induced machine. 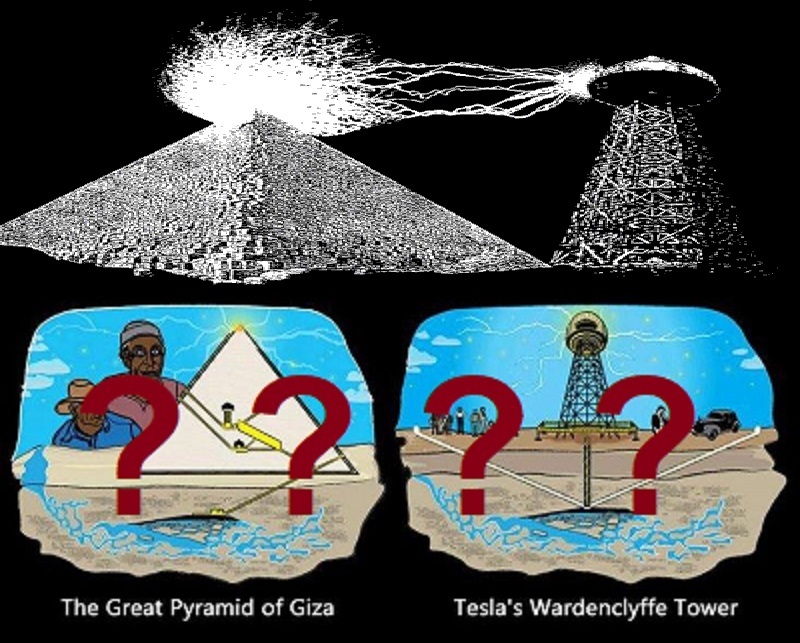 After years of intense in depth study of the Great Pyramid structure and Nikola Tesla's research..there are both pluses and minuses in the various conclusions. Nikola Tesla studied the values of electricity and came to the conclusion electricity actually has a healing quality; we know this as Piezoelectricity. The Great Pyramid intersects Ley-lines that create Piezoelectricity. This purifies the natural aquifer cisterns seated below the Giza plateau. The next step is to understand the Great Pyramids build structure. The Descending Subterranean passageway held debris in its lower descending passageway area..but not full blockage. 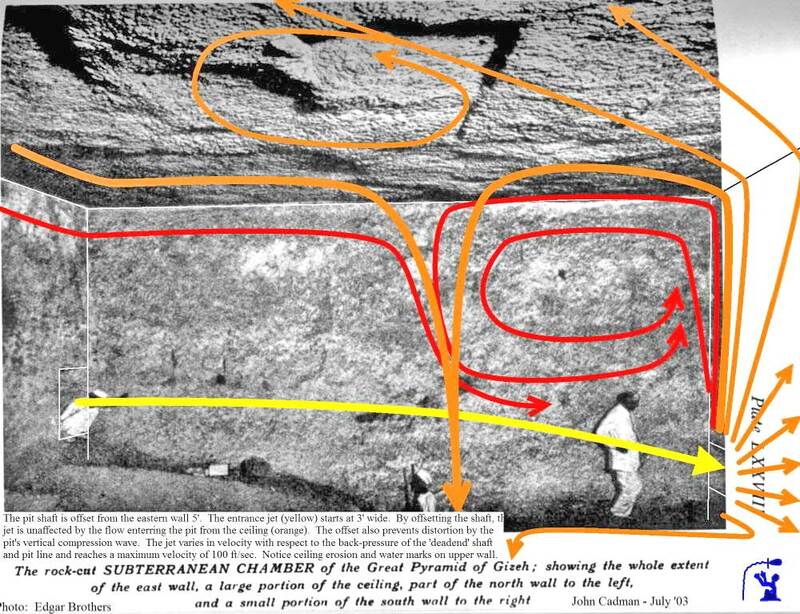 This is ascertained as rubble from Caliph al Ma’mun's men as they were first in documentation to 'break' into the pyramid; whereby history dictates they tunneled around the 3 great granite stones blocking the Ascending passageway. Many speculations are contrived with this Great Pyramid as an advanced machine, and yet the pyramid itself interfere's with that mechanical notion. Following the Pyramid's own language, the clues documented and ones still in place today, reveal a simpler more vital contribution to civilization's sustainability. If the Great Pyramid truly is a machine, the early documented clues of professional historians reveal how it works as an irrigation device. More precisely, the Great Pyramid simplified, works from natures own forces somewhat as a reverse check-valve tornado Wind Turbine. The North prevailing winds of the plateau are sucked into the pyramid by opening its door: the natural induction of air forces the wind down the descending passageway and the angle is designed to force it faster, which also helps to cool the air. In the Descending passageway (now removed) there was one single protruding stone integrated into the floors surface one must climb over to continue down the passageway. This angled stone performs a squeezing of the air, creating a 'check-valve' Vortex push. When the wind enters the Subterranean area, it is forced into a Vortex due to the different size/shaped walls, which are constructed to work as stationary 'air vanes'. The Vortexed air is cycled to the ceiling and pushes down the walls along the floor (explaining why the Subterranean area door is raised off the floor) creating a density obstacle so air can not push back out and up the Descending passageway, which would then cause the Vortexed effect to slow and nullify operations. The Subterranean area ceilings, walls and floor-pit area reveal evidence of rotational swirling seqences. Could this be part of the master builders intentional design to help direct wind flow? Or could the miniscule amounts of fine sand mixed into the air flow, over time, cause the minor swirl erosion marks? Either way, the identifying marks show a purposeful intended cause. The small passageway leading to nowhere (opposite the Subterranean entrance) is used to compound-compress air 'pushing back' into the room to reverse-circulate the air towards the ceiling and stationary inner short wall-wind vanes. 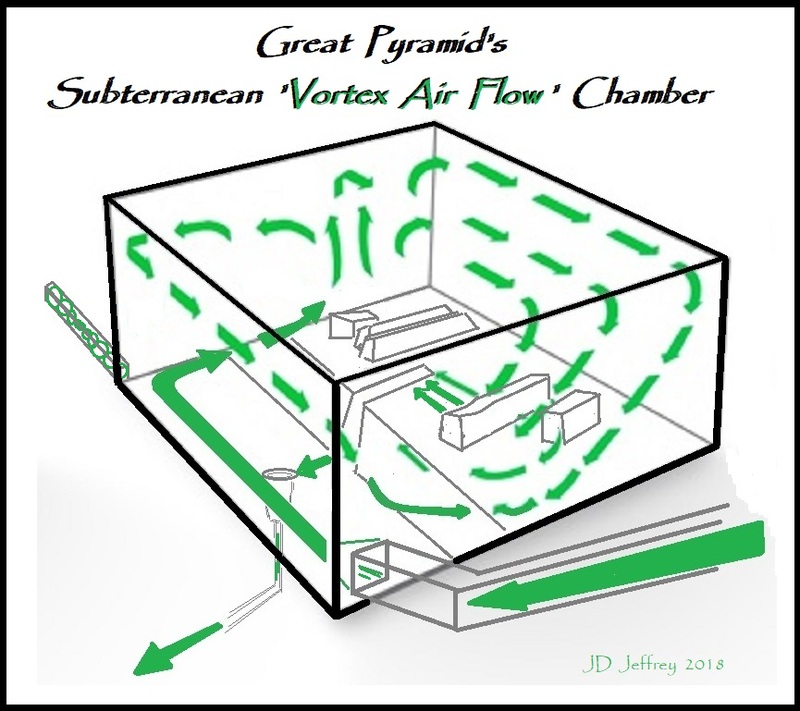 After air intake into the Subterranaean area has cycled, this Vortex of forced-cooled air then can only go one place; down the tube known as the Pit or Grotto of the Subterranean area, which is angled for a purpose. It pushes the Piezo-ionic purified water held in the natural aquifer cisterns out into the fields and self irrigates the desert into a tropical paradise..self sufficient. All we need do is till, seed, weed and harvest; plus minor maintenance to keep the 'pipes' clean. The captured wind creates a downward forced 'pressure vacuum' air-funnel cycling through the chamber up and around the ceiling down the walls where the stunted walls administer the vortex by splitting the air, which then forces through the floor canal into the Pit-pipe to create a plunger effect helping to move the water held in underground carved irrigation tunnels. Essentially the self-serving pump action works as a contained micro tornado inducing a cyclonic nature of forced air into a specific direction to be harnessed and controlled. According to scientific research, water from the Great Pyramid due to it's location synced with the pyramids design shape, is purified to 99.8 per cent pure. The Pyramid's shape helps to drive down the Piezo-ionic flow and amplify it. There is also a claim to one added bonus - the pyramid has shown to restructure seeds on a molecular level that helps them to grow six times faster, six times more abundant with six times more protein. Couple this with the purity of the 99.8 per cent pure water..and Giza is a living Eden paradise. "- Agricultural seeds placed in the pyramid for 1-5 days showed a 30-100% increase in yield"
You can find the full detailed analysis of the water purification and seed restructure in doctor John DeSalvo's book -'Great Pyramid Decoded' where Valery Uvarov's expanded analysis conducted by himself with aide of other noted professionals explain these procedures in detail. The next analysis is to see the foundation of the 'wind power' claim. The most prevailing wind direction over the year is in the northwest direction between 345 and 360 at wind speed of approximately 5m/s [Mortensen et al. 2006]. plenty of wind to drive the Pump system. The Great Pyramid has 'concave' sides which quite 'possibly' helps to channel North-East and North-West winds into the pyramid's doorway opening. It's also been established that the door-entrance creates 'Helmholtz' resonances caused by the wind blowing across the entry tunnel, which may help in organizing air molecules during their descent into the Subterranean Chamber administering an 'ionic wind' of colliding electrically charged air molecules increasing wind potential thrust. 5 minute video showing how the Great Pyramid's pump 'may' work. This pump [Self pumping] is a reconstruction of the Subterranean chamber under the pyramid. With the Great Pyramid's entrance designed approximately 50 feet above ground level, this would keep most wind blown sand below the entrance area. According to certain researchers, there is speculation to an inner entrance 'man-door'. This would make sense as a type of hepa-filter to filtrate sand debris moved by the wind, which could then be easily serviced and cleaned or replaced periodically if need arises. 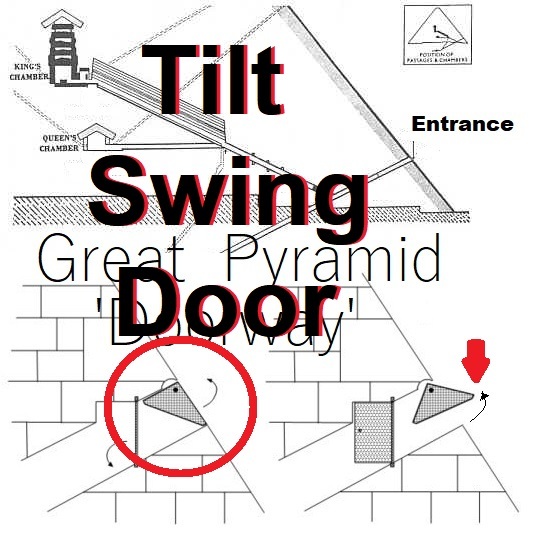 With the dilapidation in modern time to the pyramids original entrance, there is no evidence of how the outer door was propped to stay open against wind forces on it's own. It could of been a simple stick to prop it open or a small wedged-stone manually inserted between the inner upper edge of the stone swing door and it's closure seal. Tesla's Wardenclyffe Tower uses aquifers to draw reservoirs of Electromagnetism into 'Ball-Lightning' inside the Towers top-caged ball (works like a Faraday Cage for containment) which then can be metered-out going into a voltage regulator, therefore then can be sent to a receptor facility to be distributed for organized use. Tesla's research into Free Energy is not as simple as people like to think. With evidence detailing the Great Pyramid was hermetically sealed from the entrance of the Ascending Passageway 'while it was being built' , the modern machined theory that the Great Pyramid works on the same principles Wardenclyffe is designed upon, becomes improbable. The pyramid's own evidence suggest the analysis of the Great Pyramid as an Irrigation Machine working as a pump does, incorporating an air cushion plunger effect 'reverse Check-valve' system. "A plunger pump is a type of positive displacement pump where the high-pressure seal is stationary and a smooth cylindrical plunger slides through the seal. This makes them different from piston pumps and allows them to be used at higher pressures." Recent findings at the Giza plateau such as 2010's 'closed to the public' Sphinx dig, where Egyptologists used heavy machinery to dig down approximately 40 feet, have still gone unpublished. What details we do know are in their own rights curious. 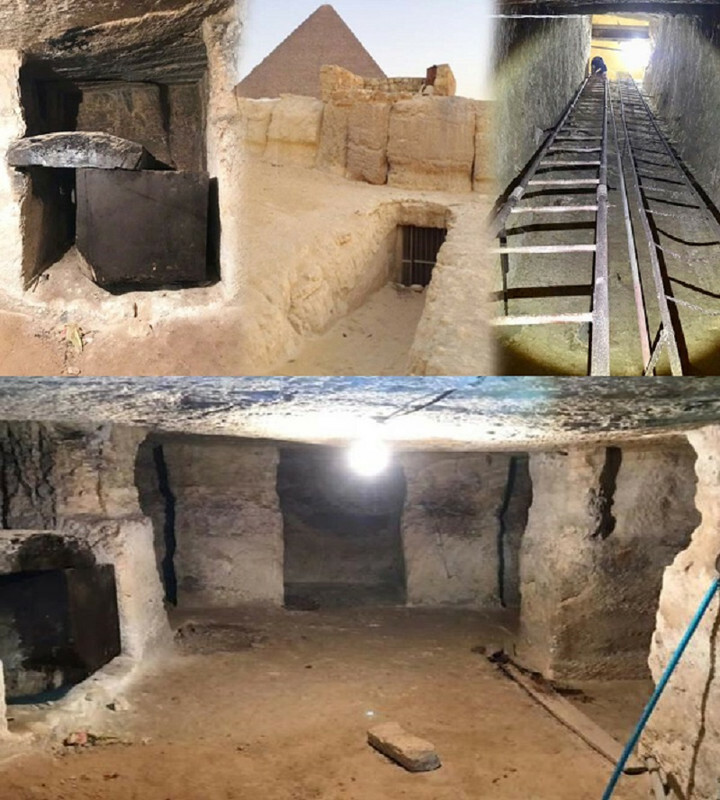 Interestingly, findings such as tunnels and caverns yet to be discerned are hinted at by egyptian authorities..
"There are secret tunnels under the Sphinx and around the Pyramids which will prove to carry many secrets of the building of the Pyramids." This mysterious underground system below Giza incorporates tunnels, passageways and caverns that were documented in the early 1900's. Dismissed as a hoax or somehow forgotten, due to modern technology and recent history investigations, these areas have been slowly investigated and are now being re-documented. With the Gizeh area particularly, evidence suggests there are counterpoints linking them that are man-made. Could certain monuments be these Germination Containment Centers to help quantify the seed acceleration process, with vast tunnel systems underneath that connect to outer lying regional deserts to irrigate and recreate the lush tropical utopia spoken of in mythology? Found at the Saqqara complex, the Schist Disc seems to be an advanced propeller..or properly an 'impeller', which could be used at certain terminal areas redirecting and pushing the water flow. It's more than possible the caverns, tunnels etc. found under Giza's main plateau are the remnants of the clean-out passages, relieving chambers/holding tanks, water-ways and irrigation directional culverts that allow water to cross vast distances irrigating desert fields into plush paradises, as Egypt's historic mythology of an Eden paradise recognizes. Certain Sahara aquifer's today such as the Lakes of Mandara still give hints of yesteryears magnificent crop yields, still retaining Citrus and Laurel trees plus Olive bushes found thriving today. With a machine such as this, food can be grown at high protein levels. Everything from corn to sugar-cane can be raised to feed not just third world nations..but all nations. 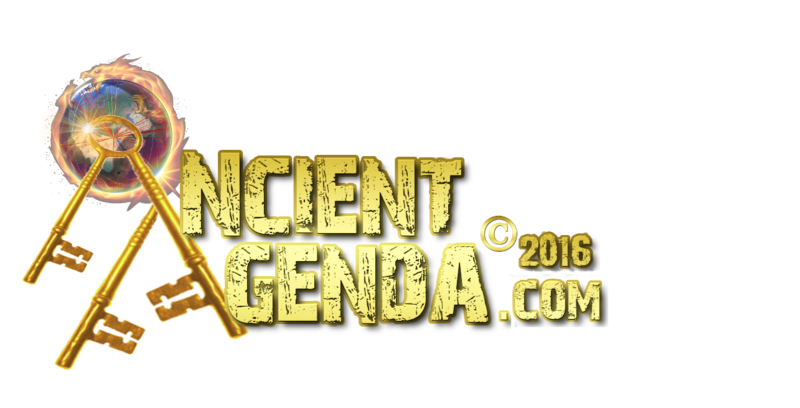 With the advent of global technology, slowly more and more of lost history is being uncovered and addressed. Time answers all questions, and we are living in the right time. With Gizeh's Great Ionic Aeration Pyramid restored and working, we could again irrigate the Sahara, and other parts of Afryca. It can also be used in various areas of our global monumental matrix. Also, if humans are for the most part vegetarians (pure foods-no pesticides or preservatives), then it's quite possible human excrement can be used to fertilize the fields preserving Earth and mankind in a self sustaining environment eliminating many world-issues. In order that we as a unified nation can raise cain allowing our world to once again become abel, our gracious Grandcestors left in place the grand architects plan to a true Fountain of Utopia.